Shares of Goldman Sachs and JPMorgan Chase have done extremely well in 2013 ... despite the fact that investors knew tougher regulations were coming soon. So much for tougher restrictions on trading hurting the titans of Wall Street? Big bank stocks edged higher early Tuesday after federal rules officially announced the final details of the long-awaited "Volcker Rule." Goldman Sachs (GS) shares rose nearly 2%. 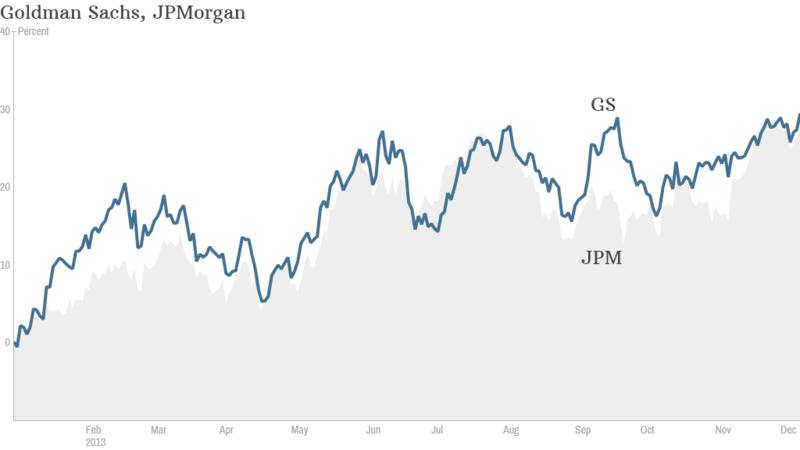 JPMorgan (JPM), Morgan Stanley (MS) and Citigroup (C) all rose about 1%. Bank of America (BAC) was up modestly as well. The Volcker Rule prohibits proprietary trading, which is when a bank trades assets using its own money for profit. But there are several exceptions to the rule, including trades related to so-called market making, a staple of the banking business, and trades designed to hedge risks in other assets, among other things. The rule, named for former Federal Reserve chairman Paul Volcker, is part of the 2010 Wall Street reform act. Five federal regulatory agencies are set to approve the draft on Tuesday. Banks will have until July 2015 to fully conform to the new regulations. While there was some uncertainty around the final rule, investors have known for a long time that the government would take steps to curb proprietary trading this year. In addition, most major banks have already shut down their proprietary trading desks. Bank stocks have been among the top performers in this year's market rally. The Financial Select Sector SPDR (XLF) exchange-traded fund, which holds most of the big bank stocks, is up nearly 33% so far this year, compared with a gain of about 27% for the S&P 500. Investors first started to pile into bank stocks last year after three years where the group lagged due to the lingering effects of the 2008 financial crisis. But despite the gains of the past two years, bank stocks are still trading at a discount to the broader market. The S&P 500 financial sector is trading at 12.5 times next year's earnings estimate. That's still fairly cheap compared with a valuation of 15 times 2014 profit forecasts for the overall S&P 500.